BAM7 was the biggest event in Australian FGC history! Thank you everyone for coming to Battle Arena Melbourne 7! BAM (Battle Arena Melbourne) is a three day fighting game tournament and a major highlight in the Australian tournament season. Our seventh annual event promises to be one of the biggest ever. With exclusive international guests and more special announcements to come. The event will remain one of the best run and respected events that includes a fun and inclusive community approach, with high class competitive play. We expecting to retain a strong attendance of 300+ and play host to fighters from all over Australia and indeed the surrounding area. 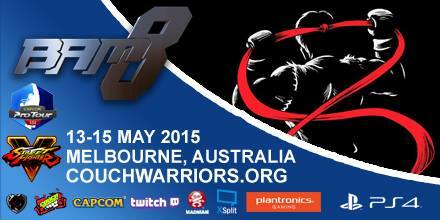 CouchWarriors is proudly partnering with New Game Plus TV as the BAM7 media streaming partner. Look forward to many more exciting announcements on the event shortly.